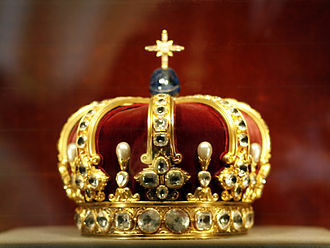 [a] Gustav IV Adolf was deposed by a coup d'etat on March 9, 1809, and Charles XIII was appointed king in his place. The Franco-Swedish War or Pomeranian War was the first involvement by Sweden in the Napoleonic Wars. 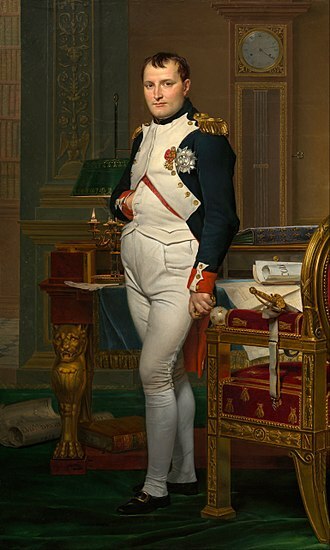 The country joined the Third Coalition in an effort to defeat France under Napoleon Bonaparte. 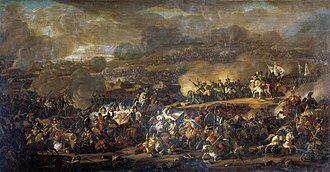 In 1803 Britain had declared war on France, at this time Sweden had remained neutral together with the Nordic countries Denmark–Norway and Prussia. But after the execution of Louis-Antoine-Henri de Bourbon-Condé in 1804, the Swedish government broke all diplomatic ties with France and concluded a convention allowing the British to use Swedish Pomerania as a military base against France, in exchange for payments. Russia also promised Sweden that 40,000 men would come to the aid of the country if it was threatened by French forces. So on 9 August 1805 Sweden joined the Third Coalition and declared war on France on 31 October. In the beginning of November 1805, a combined British, Russian and Swedish force of about 12,000 men were sent from Swedish Pomerania to liberate French-held Hanover. 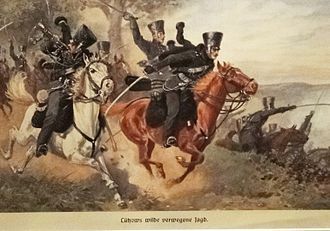 The offensive against Hanover was repeatedly delayed because of Prussia's partial reluctance that the Swedes and the Russians moved troops through Prussian territory. 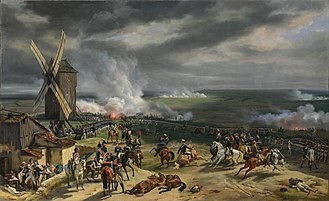 However, in December 1805, after the battle of Austerlitz, the British and the Russian forces started to evacuate Hanover, leaving only a small Swedish force alone to face the French. In April 1806, the Swedes were also forced to retreat back to Swedish Pomerania after an agreement had been concluded between Prussia and France. But during the summer of 1806 Prussia formed the Fourth Coalition against France, which gave Sweden the right to occupy Lauenburg. But during the autumn, the French forces advanced rapidly and soon much of the western German regions were occupied, this forced the Swedish troops on a retreat towards Lübeck. The plan was that the troops from there could take the sea route to Stralsund in order to avoid the advancing French forces. The Swedes were still caught by the French on the 6 November while they loaded their ships at Lübeck, and following the battle of Lübeck about 1,000 Swedish soldiers had to surrender to the numerically superior French forces. The French army began their offensive towards Swedish Pomerania in early 1807 and besieged Stralsund on 15 January. This was the beginning of a seven-month-long siege, and since the French forces also were engaged in warfare elsewhere this increasingly reduced the number of troops stationed around Stralsund. 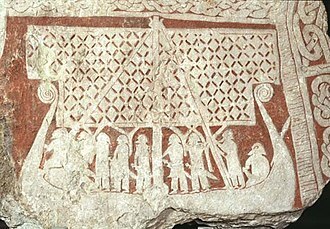 When the Swedes were reinforced on 1 April it was decided that they would attempt to break the siege. 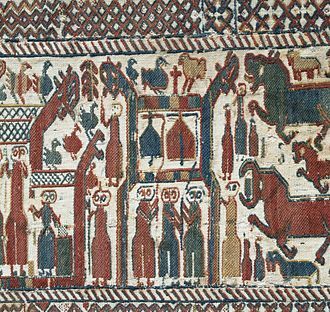 This was done with some success since the Swedes managed to take Usedom and Wolin. But the French chose to counterattack, and a force of 13,000 men attacked the Swedes from Stettin on 16 April. This forced the left section of the Swedish army to withdraw, and another division in Ueckermünde was then cut off and later captured. On 18 April, France and Sweden agreed on a ceasefire according to which the French were to leave Pomerania. 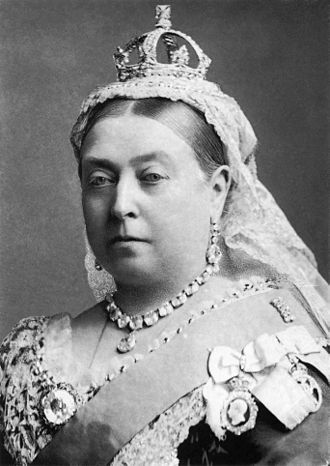 However, the Swedish government refused to join the Continental System and denounced the armistice under the influence of British diplomacy on 8 July. On 6 August 1807, 50,000 French, Spanish and Dutch troops under Marshal Guillaume-Marie-Anne Brune began an assault on Swedish Pomerania and besieged Stralsund again. On 20 August 1807, the defenders of the city capitulated and the remains of the Swedish army was surrounded at Rügen. However, Swedish General Johan Christopher Toll managed to conclude the convention of Schlatkow with Marshal Brune on favorable terms and his forces withdrew to Sweden with all of their munitions of war on 7 September. 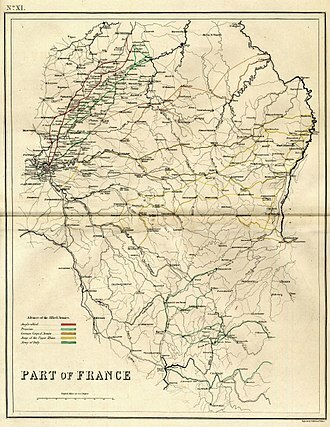 The Franco-Russian Treaty of Tilsit left Britain and Sweden without other allies in the war against France. On 21 February 1808, Russia joined the war against Sweden by invading Finland and on 14 March the same year, Denmark-Norway also declared war on Sweden. Danish and French-Spanish troops began preparations for an invasion of Skåne in Sweden, but the plan was soon aborted, and the war was instead directed to the Norwegian-Swedish border. Sir John Moore's expedition sent by the British government to protect Sweden from possible French-Danish attack arrived on 3 May 1808 and stayed until July when it was redirected to Portugal. 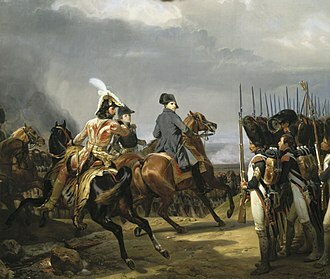 Napoleon's plans to invade Sweden was never realized due to the British activity on the Baltic Sea, the weakness of the Danish military and hesitations of French Marshal Bernadotte. Bernadotte's actions made him popular enough to be elected as a Swedish Crown Prince after the coup d'état in March 1809. On 30 August 1809, the new Swedish government was to conclude the Treaty of Fredrikshamn with Russia legitimizing the Russian annexation of Finland and Åland. A peace treaty between Sweden and Denmark-Norway was signed with no territorial adjustments on 10 December 1809. On 6 January 1810, Sweden signed a Russian-mediated Treaty of Paris with France regaining Pomerania, at a cost of joining the Continental System. On 17 November 1810, Sweden was forced to declare war against Britain and all British goods in Swedish Pomerania were seized. 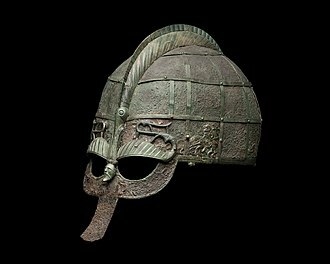 The government-supported smuggling continued, however, over the North Sea and the English fleet was informed that it would be a phantom war. The war lasted until 1812 and no military action was taken. The invasion of Java in 1811 was a successful British amphibious operation against the Dutch East Indian island of Java that took place between August and September 1811 during the Napoleonic Wars. The Kingdom of Holland was annexed to the First French Empire in 1810, after the fall of French colonies in the West Indies in 1809 and 1810, and a successful campaign against French possessions in Mauritius in 1810 and 1811, attention turned to the Dutch East Indies. Troops were landed on 4 August, and by 8 August the undefended city of Batavia capitulated, the defenders withdrew to a previously prepared fortified position, Fort Cornelis, which the British laid siege to, capturing it early in the morning of 26 August. The remaining defenders, a mixture of Dutch and French regulars and native militiamen, the island remained in British hands for the remainder of the Napoleonic Wars, and was restored to the Dutch in the Convention of London in 1814. 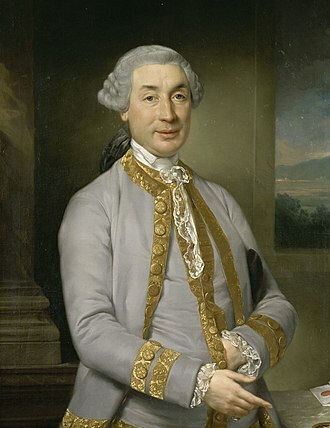 The Netherlands had been controlled by France for several years and was already at war with Britain, the strongly pro-French Herman Willem Daendels was appointed Governor General of the Dutch East Indies in 1807. He arrived in Java aboard the French privateer Virginie in 1808, in particular, Daendels established an entrenched camp named Fort Cornelis a few miles south of Batavia. He improved the defences by building new hospitals, arms factories. In 1810, the Netherlands were formally annexed by France, as part of the resulting changes, Jan Willem Janssens was appointed personally by Napoleon Bonaparte to replace Daendels as Governor General. Janssens had previously served as Governor General of the Cape Colony and he arrived in Java in April 1811 aboard the French frigates Méduse and Nymphe and the corvette Sappho, accompanied by several hundred French troops and some senior French officers. The British had already occupied the Dutch East Indian possessions of Ambon and they had recently captured the French islands of Réunion and Mauritius in the Mauritius campaign of 1809–1811. 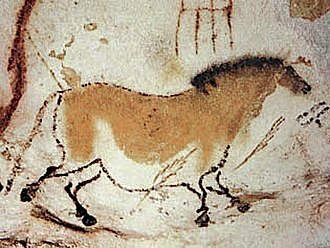 With the large forces which had made available to him for the Mauritius campaign, Minto enthusiastically adopted the suggestion. 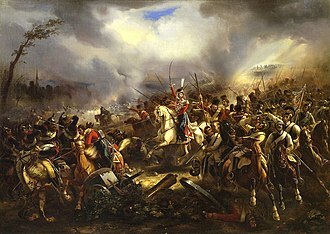 The Waterloo Campaign was fought between the French Army of the North and two Seventh Coalition armies, an Anglo-allied army and a Prussian army. Initially the French army was commanded by Napoleon Bonaparte, but he left for Paris after the French defeat at the Battle of Waterloo. Command rested on Marshals Soult and Grouchy, who were in turn replaced by Marshal Davout, the Anglo-allied army was commanded by the Duke of Wellington and the Prussian army by Prince Blücher. 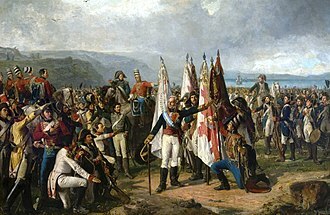 Rather than wait for the Coalition to invade France, Napoleon decided to attack his enemies and he chose to launch his first attack against the two Coalition armies cantoned in modern-day Belgium, part of the Netherlands but until the year before part of the First French Empire. 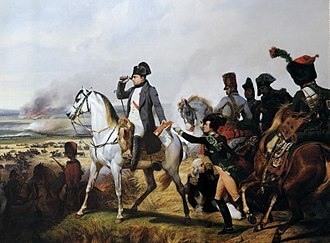 On 16 June the French prevailed with Marshal Ney commanding the left wing of the French army holding Wellington at the Battle of Quatre Bras and Napoleon defeating Blücher at the Battle of Ligny. On the night of 17 June the Anglo-allied army turned and prepared for battle on a gentle escarpment, the next day the Battle of Waterloo proved to be the decisive battle of the campaign. The next day he left Wavre and started a retreat back to Paris. After the defeat at Waterloo, Napoleon chose not to remain with the army and attempt to rally it and this he failed to do and was forced to abdicate. 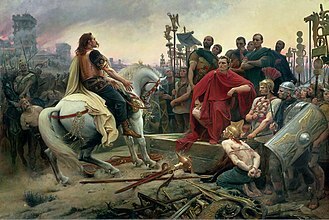 The two Coalition armies hotly pursued the French army to the gates of Paris, during which the French on occasion turned and fought some delaying actions, in which thousands of men were killed. Initially the remnants of the French left wing and the reserves that were routed at Waterloo were commanded by Marshal Soult while Grouchy kept command of the right wing. However, on 25 June Soult was relieved of his command by the Provisional Government and was replaced by Grouchy, Cloud which ended hostilities between France and the armies of Blücher and Wellington. The two Coalition armies entered Paris on 7 July, the next day Louis XVIII was restored to the French throne, and a week on 15 July Napoleon surrendered to Captain Frederick Maitland of HMS Bellerophon. 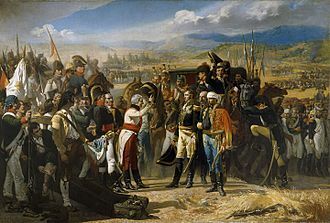 Napoleon was exiled to the island of Saint Helena where he died in May 1821, under the terms of the peace treaty of November 1815, Coalition forces remained in Northern France as an army of occupation under the command of the Duke of Wellington. Guillaume Marie-Anne Brune, 1st Comte Brune was a French soldier and political figure who rose to Marshal of France. The son of a lawyer, Brune was born at Brive-la-Gaillarde and he settled in Paris before the French Revolution, studied law, and became a political journalist. 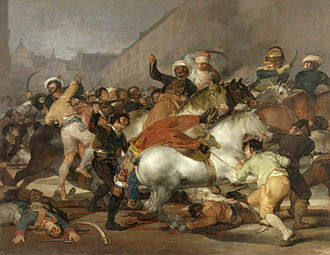 Following the French Revolution he joined the Cordeliers and was a friend of Georges Danton, Brune was appointed brigadier general in 1793 and took part in the fighting of the 13 Vendémiaire against royalist insurgents in Paris. In 1796 he fought under Napoleon Bonaparte in the Italian campaign and he rendered further good service in Vendée, and in the Italian Peninsula during the years 1799–1801. 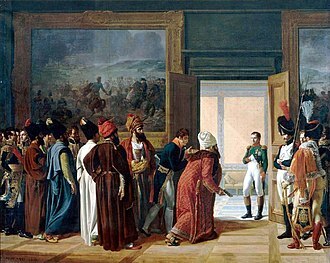 In 1802 Napoleon dispatched Brune to Constantinople as ambassador to the Ottoman Empire, during his two-year diplomatic service, he initiated relations between France and Persia. Following his coronation as Emperor of the French in 1804, Napoleon made Brune Marshal of the Empire. Brune was recalled to service in 1815, during the Hundred Days. Swedish Pomerania was a Dominion under the Swedish Crown from 1630 to 1815, situated on what is now the Baltic coast of Germany and Poland. Following the Polish War and the Thirty Years War, Sweden held extensive control over the lands on the southern Baltic coast, including Pomerania and parts of Livonia and Prussia. Sweden, present in Pomerania with a garrison at Stralsund since 1628, had gained control of the Duchy of Pomerania with the Treaty of Stettin in 1630. At the Peace of Westphalia in 1648 and the Treaty of Stettin in 1653, Sweden received Western Pomerania, with the islands of Rügen and Wolin, and a strip of Farther Pomerania. 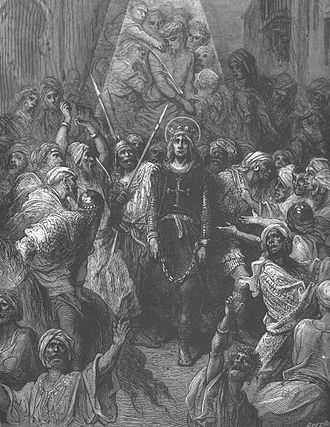 The peace treaties were negotiated while the Swedish queen Christina was a minor, instead, it remained part of the Holy Roman Empire, making the Swedish rulers Reichsfürsten and leaving the nobility in full charge of the rural areas and its inhabitants. These areas were ceded to Brandenburg-Prussia and were integrated into Brandenburgian Pomerania, in 1720, Sweden regained the remainder of her dominion in the Treaty of Frederiksborg, which had been lost to Denmark in 1715. The largest cities in Swedish Pomerania were Stralsund, Greifswald and, until 1720, Rügen is today Germanys largest island. On 10 July 1630, the treaty was extended into a pact in the Treaty of Stettin. By the end of year the Swedes had completed the military occupation of Pomerania. As a consequence Pomerania lapsed into a state of anarchy, thereby forcing the Swedes to act, from 1641 the administration was led by a council from Stettin, until the peace treaty in 1648 settled rights to the province in Swedish favour. At the peace negotiations in Osnabrück, Brandenburg-Prussia received Farther Pomerania, the recess of Stettin in 1653 settled the border with Brandenburg in a manner favourable to Sweden. 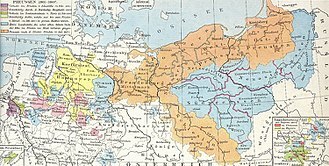 The border against Mecklenburg, along the Trebel and the Recknitz, the nobility of Pomerania was firmly established and held extensive privileges, as opposed to the other end of the spectrum which was populated by a class of numerous serfs. Even by the end of the 18th century, the made up two-thirds of the population of the countryside. The Gunboat War was the naval conflict between Denmark–Norway and the British Navy during the Napoleonic Wars. 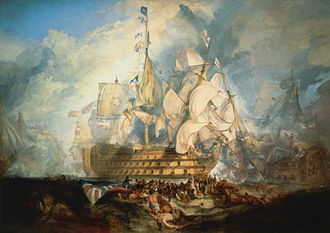 The wars name is derived from the Danish tactic of employing small gunboats against the conventional Royal Navy, in Scandinavia it is seen as the stage of the English Wars, whose commencement is accounted as the First Battle of Copenhagen in 1801. 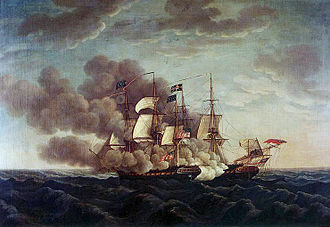 The naval conflict between Britain and Denmark commenced with the First Battle of Copenhagen in 1801 when Horatio Nelsons squadron of Admiral Parkers fleet attacked the Danish capital, the tactical advantages were that they were highly manoeuvrable, especially in still and shallow waters and presented small targets. On the other hand, the boats were vulnerable and likely to sink from a single hit and they therefore could not be used in rough seas, and they were less effective against large warships. The Danish Commander Steen Andersen Bille is credited with being the force behind the post-1807 Dano-Norwegian strategy of gunboat warfare. Below is a description of each of the four classes of gunboats according to Junior Lieutenant Garde, These were the larger type of gunboat. Each was armed with two 24-pound cannon and four 4-pound howitzers and had an establishment of 69 –79 men. Kanonjollen, These were the type of gunboat. Each was armed with one 24-pound cannon and two 4-pound howitzers, and had wartime establishment of 41 men, These were the larger, mortar-armed gunboats. 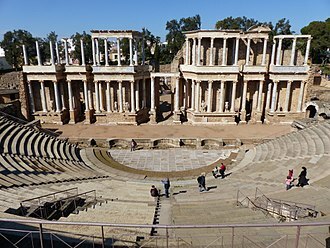 Each was armed with one 100-pound mortar and two 4-pound howitzers, and had an establishment of 40 men. Morterbarkasserne, These were smaller, mortar-armed gunboats, each was armed with one mortar and had a wartime establishment of 19 men. They were little more than ordinary ships’ boats into which a mortar had been set and they had a tendency to leak badly after 5 –7 mortar shells had been fired. Their crews had to bring back into harbour, remove the mortar. Reserve crew who could not be accommodated on board were quartered in buildings on land or in the frigate Triton which was in ordinary, battle-ready gunboats had their crews on board. Defences on the Norwegian coast in 1808 are listed at Royal Dano-Norwegian Navy order of battle in Norway, ten schooner-rigged gunboats capable of operating in the rougher Norwegian Sea were built in Bergen and Trondheim in the years 1808 to 1811. 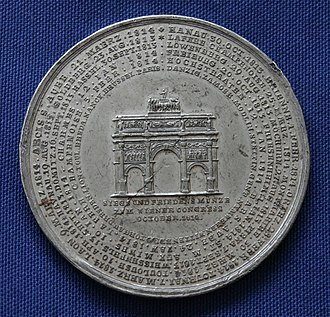 Part of France engraved by J. Kirkwood, showing the invasion routes of the Seventh Coalition armies in 1815. Red: Anglo-allied army; light green: Prussian army; orange: North German Federal Army; yellow: Army of the Upper Rhine; dark green: Army of Italy. Emperor Francis I of Austria and his Chancellor Prince Clemens Metternich crossing the Vosges Mountains on 2 July 1815 followed by other dignitaries and surrounded by Seventh Coalition soldiers. 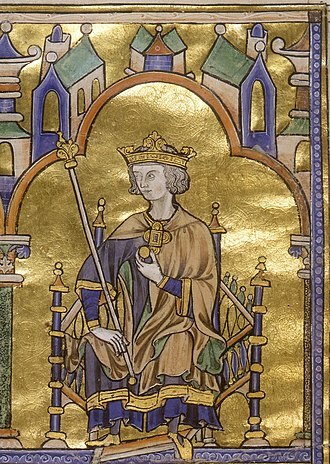 Lieutenant-General Caro y Sureda, 3rd marqués de La Romana. Batavia, capital of Dutch East Indies, with citadel in the background.